Best Prices Ever on N.T. Wright books! As I wrote in the last post, The right Rev. Wright was excellent in his lucid and inspiring lecture at Redeemer’s Center for Faith & Word in New York City last week. Thanks to those who prayed for us—we unloaded the van in an (illegal) parking place that providentially opened up, and we couldn’t have been more glad. Central Park West is stunning in springtime, and maddening all the time, with traffic and people and all the mid-town Manhattan tension creating a stressful spot to unload boxes and cash. Load-in was an adventure, but late-night load-out was cool. Thanks be to God, and all who helped. Now, we’ve got some extra books. I’ll be candid. One doesn’t want to run out of books during an author appearance—a blunder we’ve made only a time or two—so we tend to take more books than any reasonable bookseller can hope to sell. The Wright event did have nearly 800 folks and this new book about virtue is certainly urgent and important. You may know about the conference about Wright held at Wheaton last week, too (google that and see the lectures and panels) so he is quite the man, these days. We sold a lot of books, but we have a lot left over. I’m not ashamed of this, and it isn’t anything cheesy to say we are going to offer a one week “inventory clearance” sale. We would rather lose some dough selling them at a great savings to you, rather than pay the high shipping costs to send ’em back. Win/ kinda win, I’d say. Here are the items we are selling cheap. Half off, mostly. Awww right! It is not on sale, but you should know that we now have a rare Wright paperback, an early 90’s set of messages about the Holy Spirit. It had been out of print for quite a while and we are thrilled to find it is now available again. I read it over a decade ago and loved it. And, while we are at it, you may not know that besides his astute, readable “For Everyone” New Testament commentaries, IVP has recently released a set of almost a dozen small group Bible study guides put together by N.T. Wright. They are called the “N.T. 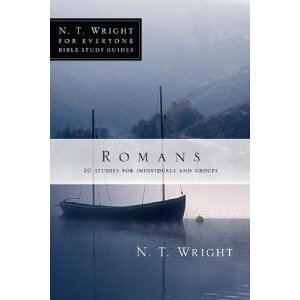 Wright for Everyone Bible Study Guides” and are quite useful little resources for personal study or discussion groups or Bible classes. Most are six sessions and they sell for $8.00. Of course we stock all other Wright books, and a couple that offer critique of his views. Drop us a line if you have any questions. Remember the half-price deal is good for one week only. We’re acting like a real discount store, here, huh? Woo-hooo. Sale time!